We flew to Amsterdam on the first leg of our journey home last weekend. Seats by the window in a plane full to the cabin walls. The Dutch guy we had to squeeze by to reach our seats was nursing a copy of an orange hardback, Factfulness in fat white letters on the cover. The same edition – the English language edition – that I have on my shelf at home. A warm feeling of brotherhood washed over me. I wanted to tell him how much I’d enjoyed reading it myself. How I’d felt uplifted by it. But he was deeply absorbed. It was open on his lap as we edged down the aisle. Standing, he trapped a finger in it to keep his place as he let us pass. He opened it again directly we were all seated and I felt injecting my enthusiasm would be a selfish interruption. The incident reminded me that I should write a review, though, so I’m sharing my enthusiasm for Factfulness here with you instead. The author is Hans Rosling. (The principle author – we’ll come to the other two names on the cover below.) Rosling, who died last year, was a medical doctor, a professor of International Health at Stockholm’s Karolinska Institute and an enthusiastic statistician. He was also a very engaging public speaker and some of his lectures are available as Ted Talks. Factfulness was his last work. He was already engaged in writing it when he was diagnosed with pancreatic cancer. This is a malignant cancer with a rapid development. (I know. It took my own father.) Rosling cancelled all his other engagements and focused on completing the book in the little time he had left. He died in February 2017 and Factfulness was published in the spring of 2018. Like a lot of Rosling’s fans, I saw him first in an internet clip enthusing about statistics. I’ve always had a problem comprehending statistics – the more complicated the greater the problem. But Rosling’s showmanship and his bubble diagram software made statistical complexity easy to understand. Like many others, I admired his ability to cut through the static of media and opinion. And I took comfort from his reassurances that the world is getting better. Not that this is the best of all possible worlds. Terrible things still happen and there is much work to be done. But, contrary to what we often believe, the world is on a path of improvement and most people in the whole world are better off today than they were 50 years ago. Towards the end of April I was feeling dispirited about the state of the world. The combination of Brexit and Trump, migration politics and the resurgence of the right was weighing me down. I needed something to raise my mood, so I bought a copy of Factfulness. In all honesty, I didn’t expect it would help much. More than half of Rosling’s charm lies, I thought, in his delivery. How could a book convey that? And yet it does. The language of the book is surprisingly good at capturing the cadence of his voice. (Though perhaps it helps to have heard him speak.) The personal stories he uses in each of the chapters to illustrate his own initial perspective still come across as fresh, even if you’ve heard some of them before from video clips. His gentle, self-deprecating tone is preserved and disarms you. It reminds you how you share the very same ignorance or prejudice. It prepares you to challenge your assumptions and to open yourself to “factfulness”. The book’s subtitle is: Ten reasons we’re wrong about the world – and why things are better than you think. The numbers and the paradox position the book in a plethora of “business inspirational” titles. This is clearly the market the book is aimed at. The puff from Bill Gates on the front cover – One of the most important books I’ve ever read – puts it at the head of the pack. But the teacher in me cries out that the book deserves a much wider readership. It should be used in teacher training. It should be used in school teaching. In fact, this is the ambition of the authors. 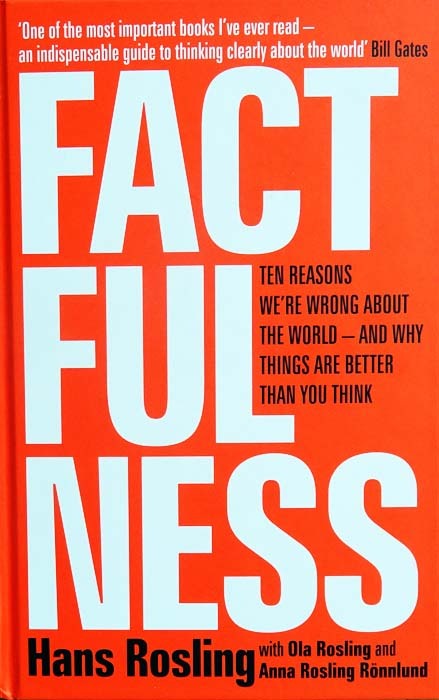 In their presentation of Why we wrote Factfulness, Hans Rosling’s co-authors, his son and daughter-in-law Ola Rosling and Anna Rosling Rönnlund, specifically mention developing teaching material as their initial motivation. (At 2mins 55secs to be exact!) The Gapminder website also has a section for Teachers. Where does the majority of the world’s population live? I won’t tell you the answer – that would spoil your fun in taking it! (The whole questionnaire is in the book, but you can take it on-line on the Gapmaster website.) I will tell you that, taking the test before reading the book I scored 7/13 – not bad. (And better than the random “chimpanzee” score.) After making my notes for this review, I took it again on-line. This time I got 11/13. I’m improving, but still not good enough to be a real “Gapminder”. It is surprisingly hard to escape the pull of our shared ignorance and our prejudice. I should say that I did not notice Hans Rosling ever using the words ignorance or prejudice in the book. * His ambition is to win his readers’ trust. Describing their mistaken beliefs in such combative terms would make that more difficult. Instead he comforts his readers. First when you have finished this book, you will do much better… because I will have shared with you a set of simple thinking tools. These will help you get the big picture right, and improve your sense of how the world works, without you having to learn all the details. Because most people, however well or badly educated, however highly placed, “get it wrong”. The book is structured with an Introduction and ten chapters focusing on the ten “Instincts” which Rosling provides tools for. It ends with an eleventh chapter, “Factfulness in Practice”, which summarises the book and reminds the reader of the tools. Each of the chapters begins with a humorous summary. (For example: How to hide 40 million airplanes, and how I kind of won the Nobel Peace Prize). This is followed by an anecdote that illustrates Rosling’s own initial failure to understand something. There is an overview of the chapter’s theme including a glance at one of the relevant questions from the questionnaire. Then come a series of real world examples showing how we let ourselves be fooled, or fool ourselves. These are paired with examples drawn from the Gapminder database that show how the true world situation is much different from the way we believe the world to be. Rosling is keen to remind us that things are not all good and getting better in the world. In chapter four, “The Fear Instinct”, for example, he points out that deaths from terrorism have increased in the world over the last decade. However, contrary to our everyday beliefs, the number of terrorism-related deaths in the world’s richest countries (including most of Europe and the USA) has stood still or declined. In the USA, the fear of terrorism is as great now as it was in 2001, immediately after 9/11. Yet you are 50 times more likely to be killed by a drunk-driver in the USA, than you are by a terrorist. At the end of each chapter is a short summary of the arguments the chapter is trying to get across. This is followed by recommendations for how to tackle our instincts in each case. These are the tools, and they are illustrated with a doodle-like drawing as an aid to memory. The final quarter of the book is taken up with a series of appendices. These contain further information, notes and especially the sources. 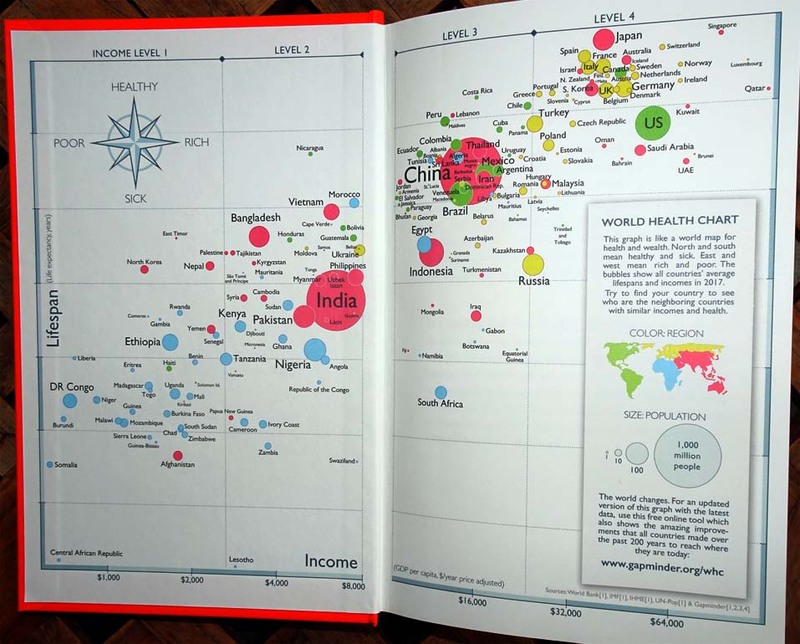 All the data that lies behind the book, and behind the animated bubble charts Rosling used in his lectures (and that you can play with on the Gapmaster website). Everything that enables Factfulness to be so positive about global development trends. It all comes from publicly available sources. Following the links provided, it is possible for the curious reader to double check. Nothing here is fake news, nothing is loosely expressed opinion. This is another reason why I find the book so uplifting. The review you’ve just read has in passing several links to video material and to the Gapminder website [http://www.gapmaster.org/]which is very well worth a visit. If, like me, you are a Rosling fan, and if you’ve seen all the Ted Talk clips, you might also like to see Rosling’s World. This is a Swedish TV documentary (c. 1 hour long) about Hans Rosling. It’s made by Pär Fjällström who “lets Hans Rosling tell the story [of] his life and [describe] what has shaped his world view.” The film, which I saw on Swedish TV in the spring, now seems to be freely available on the Documentary.net website. 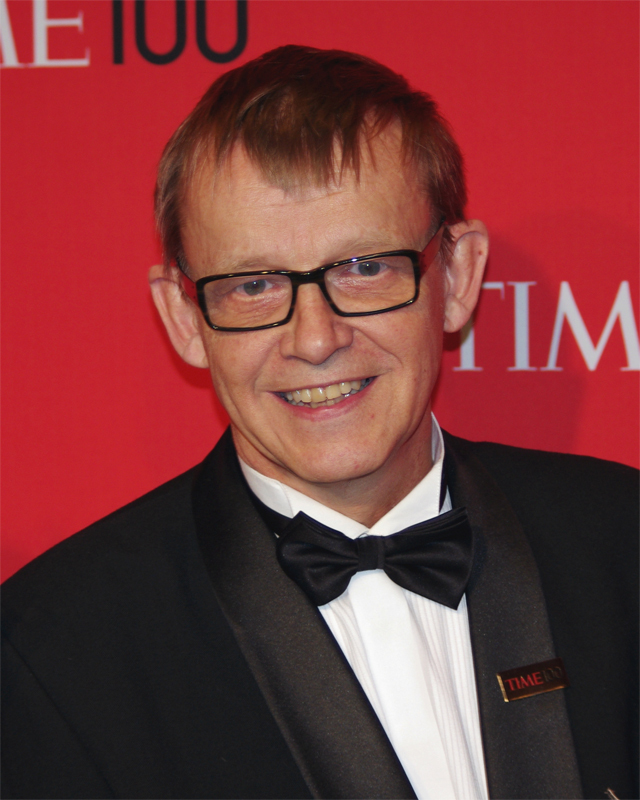 [https://documentary.net/video/roslings-world-a-documentary-about-hans-rosling/] English subtitles are available. *Although Hans Rosling doesn’t use the word ignorance in Factfulness, there is a section of the Gapminder website that is given over specifically to combating ignorance. The Ignorance Project, though, does not target individuals – readers or viewers. Rather it rather looks at the statistical degree of ignorance in a population in order to identify “what teaching materials we should develop”.